Size of Male: 65-90 lbs., 25.5-27.5 in. Size of Female: 65-90 lbs., 23.5-25.5 in. Do you own this Dog breed? Please tell us about it in the form at the bottom of this page. Need a good Puppy Name? Visit our Puppy Names page for 1000s of top dog names. The largest of the Schnauzer breeds, the Giant Schnauzer sports at least two distinctive features apart from its apparent size. One is a patch of fur that looks a lot like a beard. Another is a pair of hairy eyebrows that may look like some funky bangs. For unknown reasons, this playful and versatile working dog enjoys a modest following among dog fans. If you think the breed is German, you’re quite right. Historical accounts suggest that these gigantic pooches originated from a number of cross-breeding experiments with the standard schnauzer in the German countryside. Stare at this large Schnauzer and perhaps you’ll see some semblances of the following breeds: cattle dog, black Poodle, Great Dane, wolf spitz, Bouvier des Flandres and Wirehaired Pinscher. Prior to World War I, the pooches served as cattle herders, butcher’s assistants, and watch dogs of stockyards and breweries. After the war, they took on the role of police dogs and pets. Also known as the Riesenschnauzer, these large dogs may have an imposing stature, but if there’s anyone who should be afraid of the breed, it’s not going to be you but intruders. When not on watch dog mode, the Giant Schnauzer is very clingy but not showy. You should consider getting another pet if you only come home to sleep. This dog breed demands a great deal of bonding time, exercise and attention. They can be impatient with toddlers and dominant around other pets. Living Environment – Don’t keep your pet cooped in an apartment. At the minimum, a large yard is necessary. 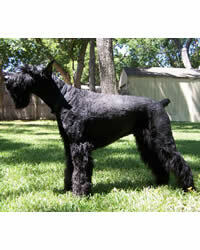 It is also recommended that you divide the time that your Giant Schnauzer stays inside and outside of your home. Indoor living takes care of this dog breed’s socialization needs, while a well secured outdoor space gives your pet the much-needed opportunity to run freely. Grooming – Despite being low shedders, this dog breed is demanding to maintain in the grooming department. You must be prepared to dedicate a portion of your daily routine to brushing and cleaning the dog’s beard. The hairs must be trimmed so as not to touch the ground and catch dirt. Combing is done twice weekly while shaping is best done by a professional groomer every 4 to 6 months. Diet & Exercise – There are some health conditions whose risks can be reduced through careful dietary planning. Avoid feeding your dog food choices that can trigger canine arthritis and bloat. For an extra yummy treat, serve beef. Not just any exercise will do. It must be vigorous enough for the energetic pooch, and you must be ready to ensure that this need is met on a daily basis. Some suggested activities are hiking, biking and off-leash play. Health – A clean bill of health is rare nowadays. This Schnauzer dog breed is not exempt from this. In fact, there are a couple of conditions linked with the breed. Gastric torsion, canine hip dysplasia and autoimmune diseases such as anemia and canine hypothyroidism top the list. There are also a few cases of toe cancer and epilepsy. Strong will and intelligence combined will make dog training a challenging activity for newbies. This dog breed requires a dominant and seasoned trainer. In terms of housebreaking though, you’ll find the pooches to be absolutely delightful and compliant. The Giant Schnauzer performs best when you invest in respect training, basic dog obedience training and intense socialization during the initial stages. The dog is an excellent athlete, therapy dog and police partner. Please tell us about your experience with a particular dog breed, and upload a picture if you have one! Do you have a dog picture to add? Great! Click the button and find it on your computer. Then select it.